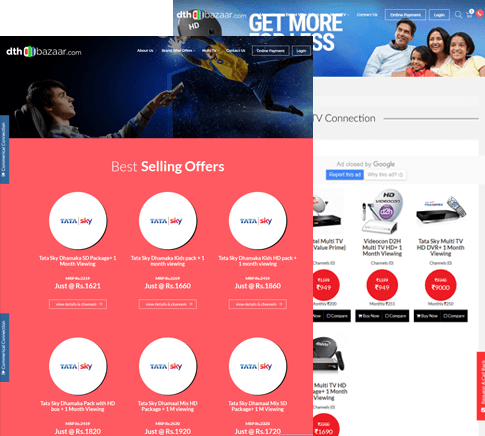 The Online Visibility of their DTH marketplace was very low, the online store was having very less organic traffic and sales were also all time low. The challenge was to leverage digital marketing techniques to increase the brand presence online. The company’s ad campaigns were not performing as desired. Precise choice of keywords to ensure relevancy of search ads was taken care of. All ad campaigns were also optimized by identifying target audience and boosted to relevant people to increase lead relevancy. The solutions our team came up with helped them to take their DTH marketplace to achieve the desired brand awareness. We implemented the best SEO practices and promoted the client’s website on all relevant platforms and to a very relevant audience. This gave us desired results in terms of brand awareness, which was the first step towards growing the business. To improve efficiencies further, a landing page was dynamically upgraded to provide enriched, relevant and optimized content. This improved the contextual nature of the page and inherently improved Google’s quality scores leading to high traffic. As a result, the website ranked highly on competitive keywords. We created and optimized relevant ads and used various ad platforms to generate quality leads. This gave us an opportunity to easily convert the leads. This is because firstly we were targeting an audience set with similar interests who wanted to seriously purchase the products, and secondly, the optimized page helped convert leads faster. To make real difference to your business, get in touch with us today! Call us at +91-721 789 4696 or email at sales@digitaloye.com to talk to our experts. You can also request a call from our team by filling up this form.